Patrick McGinnity finishes with a goal to add to his five score assists, the most of any player for the game and the equalmost ever recorded by Champion Data in a pre-season game. GOAL EaglesPatrick McGinnity scores a goal. Chris Mayne's ninth disposal for the night is his first which hasn't led to a Fremantle score. Dom Sheed leads West Coast's metres gained with 486m, just shy of Nat Fyfe's 488m. GOAL DockersMatthew Pavlich scores a goal from a Turnover. BEHIND EaglesTom Lamb scores a behind from a Turnover. From 19 disposals Stephen Hill has been involved in eight scores for the Dockers, including three score assists. GOAL DockersZac Clarke scores a goal from a Kickin. BEHIND EaglesFraser McInnes scores a behind from a Stoppage. SUPERGOAL DockersCameron Sutcliffe scores a supergoal from a Turnover. RUSHED BEHIND to Dockers from a Stoppage. Fremantle's accuracy has dropped to 37 per cent after just 11 goals from 30 shots. West Coast has had 10 fewer shots but trail by just six points. Fremantle InterchangeStephen Hill was changed with Hayden Crozier due to an injury. BEHIND DockersZac Clarke scores a behind from a Turnover. Michael Johnson has won the ball off the Eagles 10 times tonight. Three have launched scores. He has reached double figures for possession gains in seven AFL matches in his career. West Coast has continued its run of momentum from the third quarter with four more unanswered goals, including two directly from centre bounces. GOAL EaglesScott Selwood scores a goal from a Stoppage. GOAL EaglesMark LeCras scores a goal from a Stoppage. RUSHED BEHIND to Eagles from a Stoppage. GOAL EaglesJosh J. Kennedy scores a goal from a Turnover. West Coast Eagles InterchangeSimon Tunbridge was substituted for Jeremy McGovern. West Coast kicked two of the last three goals in the third quarter after Fremantle had kicked nine of the previous ten. Fremantle has scored its fourth goal from chains starting in the defensive 50. Only Hawthorn averaged more than three goals from this zone last season. GOAL DockersZac Clarke scores a goal from a Turnover. 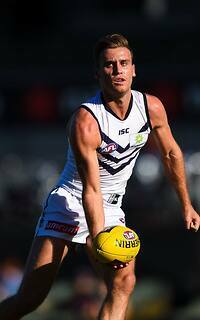 Fremantle InterchangeLee Spurr was changed with Stephen Hill due to an injury. GOAL EaglesLuke Shuey scores a goal from a Kickin. Tommy Sheridan has nine disposals in the third quarter, including a goal and a score assist. BEHIND DockersDanyle Pearce scores a behind from a Turnover. GOAL DockersTommy Sheridan scores a goal from a Turnover. BEHIND DockersMax Duffy scores a behind from a Kickin. BEHIND EaglesLuke Shuey scores a behind from a Turnover. BEHIND DockersMax Duffy scores a behind. GOAL DockersNat Fyfe scores a goal from a Stoppage. Accuracy has cost Fremantle, with just eight goals from 19 shots (42 per cent). The Dockers have scored from 76 per cent of their inside 50s, to just 42 per cent for the Eagles. BEHIND EaglesAndrew Gaff scores a behind. Andrew Gaff leads all Eagles players with 19 disposals and 16 uncontested possessions. He also has a clubhigh four tackles. BEHIND DockersChris Mayne scores a behind from a Turnover. BEHIND DockersMatthew Pavlich scores a behind from a Turnover. At halftime Fremantle leads contested possessions and tackles. The Eagles have completed just 51 per cent of tackle attempts, compared to the Dockers with 65 per cent. BEHIND DockersHayden Crozier scores a behind from a Turnover. West Coast has an advantage of 80 per cent time in forward half in the last 10 minutes of play, but have taken just five points off the lead. BEHIND DockersNat Fyfe scores a behind from a Kickin. BEHIND EaglesPatrick McGinnity scores a behind from a Turnover. GOAL DockersMichael Walters scores a goal from a Kickin, waltzing in from 70 metres with two running bounces. Josh Kennedy has taken three marks inside 50, included two contested. He has kicked one goal and two behinds. BEHIND EaglesJosh J. Kennedy scores a behind from a Turnover. Michael Johnson and Garrick Ibbotson have both won the ball off the Eagles five times. SUPERGOAL EaglesMatt Rosa scores a supergoal from a Turnover. BEHIND DockersZac Clarke scores a behind. GOAL EaglesTom Lamb scores a goal from a Turnover. Matthew Pavlich has given off his second assist for the night, as Chris Mayne puts through his second goal. GOAL DockersChris Mayne scores a goal from a Turnover. BEHIND DockersNat Fyfe scores a behind from a Turnover. BEHIND DockersCameron Sutcliffe scores a behind from a Turnover. 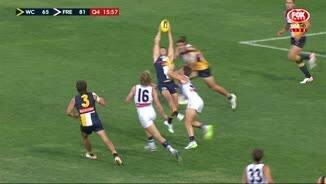 West Coast leads clearances 13 to 7 but both teams are level on seven points from this source. Chris Masten has a gamehigh 11 disposals. He has reached double figures in an opening quarter eight times in AFL matches. BEHIND EaglesChris Masten scores a behind. Five of the last six inside 50s have been Fremantle's way, with the Dockers kicking four unanswered goals. GOAL DockersCameron Sutcliffe scores a goal from a Turnover. GOAL DockersMichael Walters scores a goal from a Turnover. GOAL DockersHayden Crozier scores a goal from a Turnover. GOAL DockersJack Hannath scores a goal from a Turnover. 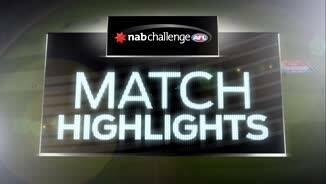 Both of Fremantle's scores have come from an Aaron Sandilands hitout to advantage. He has won seven of nine ruck contests against Nic Naitanui and Scott Lycett. BEHIND DockersMatt de Boer scores a behind from a Stoppage. Matt Priddis has launched two scores for the Eagles, both from clearances. GOAL EaglesSharrod Wellingham scores a goal from a Stoppage. GOAL DockersChris Mayne scores a goal from a Stoppage. Fremantle SubstituteConnor Blakely is into the game for an injured Nick Suban. GOAL EaglesChris Masten scores a goal from a Turnover. Fremantle InterchangeDavid Mundy was changed with Nick Suban and is possibly out for the game. 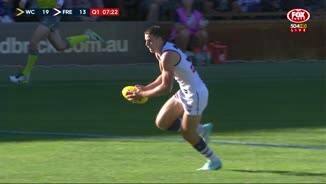 Lachie Neale has been Fremantle's leading ballwinner this preason, averaging 30.5 disposals in two games, nearly double his nearest teammate Michael Johnson with 16.5. Andrew Gaff leads the Eagles with 26 disposals per game. West Coast and Fremantle rank 14th and 18th, respectively, for average points scored this NAB Cup. 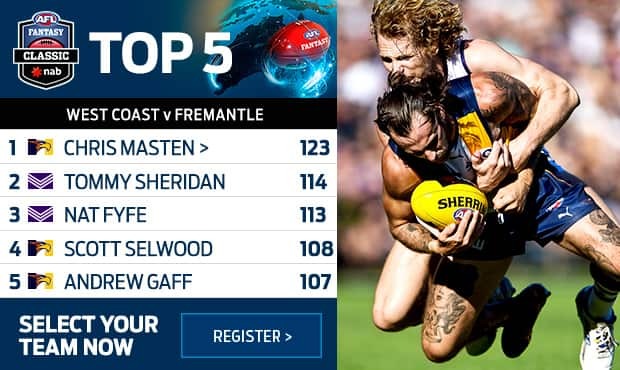 Fremantle has scored just once from a centre clearance and West Coast just three times, each from two games. Welcome to Domain Stadium for the West Coast Eagles v Fremantle Round 4 clash. A SUBLIME performance from Nat Fyfe inspired Fremantle to a 19-point win over West Coast in the final NAB Challenge clash of the pre-season at Domain Stadium. The reigning AFL Players' Association MVP gathered 29 touches and kicked a goal to help the Dockers to a 1.13.17 (104) to 1.11.10 (85) win in front of 16,032 fans. The victory was soured however with a suspected hamstring injury to defender Nick Suban. Midfielder Stephen Hill rolled his ankle in the third term but he returned in the last quarter. Hayden Crozier also rolled his ankle but it does not appear serious. The Dockers led by 35 points late in the third term before the Eagles kicked five goals in a row to cut the margin to just four points during the last quarter. 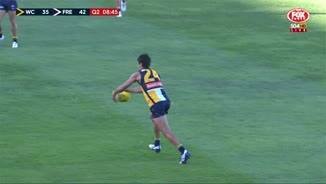 But the Dockers steadied with a supergoal to Cameron Sutcliffe, snuffing out the Eagles’ challenge. Matthew Pavlich, Zac Clarke, Michael Walters and Chris Mayne each kicked two goals for the Dockers. 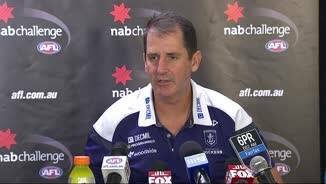 Fremantle coach Ross Lyon was concerned about the injury issues but he was positive about his side's performance. "I thought we were pretty solid," Lyon said. "Obviously conversion, … if we convert, it's quite convincing probably, it would be fair to say. "(The Eagles) fought on at the end. I thought we responded." Josh Kennedy kicked three goals in a strong performance up forward for West Coast while Chris Masten racked up 32 disposals in the midfield. Brownlow medallist Matt Priddis gathered 26 touches, including 14 contested possessions, but could not quell the influence of Fyfe. 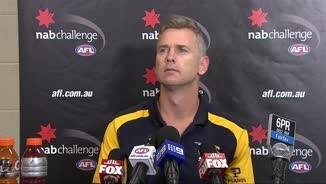 Eagles coach Adam Simpson said it was the perfect preparation for round one despite the result. "It was a really good game for preparing for round one because we hit a top-four side that brought a lot of pressure after the first 10 minutes," Simpson said. "We did some things well and we did some things poorly. I think the best thing about our night is I think we're injury-free." West Coast started brightly in the opening term. Masten kicked the opening goal of the match and gathered 11 touches for the quarter. The Eagles jumped out to a 13-point lead but Fremantle lifted its intensity. Mayne kicked the Dockers' first goal and then produced a brilliant tackle and turnover to set up Sutcliffe for the Dockers' fifth and a 12-point lead at quarter-time. Nick Suban was subbed out early in the first quarter and immediately had ice applied to his right hamstring. Fyfe took control of the game in the second. He gathered 11 touches for the quarter but he did kick two behinds from set shots. The Dockers' lead hit 20 points when Mayne kicked his second. The Eagles fought back. Tom Lamb ran into an open goal after some slick ball movement around the outer side and then Matt Rosa bombed a supergoal from a standing start to cut the margin to seven. But Walters sharked his second goal after two Eagles spoilt each other in a marking contest to ensure the Dockers led by 13 points at half-time. The Dockers midfield took over in the third, led by Fyfe. He drifted forward to mark and goal and set up a couple of others. The Dockers had a number of options pushing inside 50 as the Eagles' undermanned defence looked under pressure. The Eagles rallied at the start of the last. Kennedy kicked goals either side of three quarter-time and Mark LeCras bagged two in the last quarter to give the Dockers a brief scare. The Dockers now set themselves for a round one blockbuster clash with Port Adelaide, while the Eagles will face the Western Bulldogs at Etihad Stadium. Fremantle: The Dockers looked very potent up forward even without the services of Hayden Ballantyne and Matt Taberner. The Dockers had nine different goalkickers and cracked the 100-point barrier. Had they kicked more accurately they could have racked up a huge score. West Coast: The Eagles look depleted in defence following the loss of Eric Mackenzie to a knee reconstruction. Mitch Brown and Will Schofield also did not play against Fremantle and Elliot Yeo was forced to play on Matthew Pavlich for the majority of the match. They can ill afford any more injuries to defenders. West Coast: Tom Lamb looked lively up forward again. He gathered 13 touches and kicked a goal. He might have been robbed of another when the goal umpire ruled his soccer was touched late. It looks like he may play round one. Jackson Nelson earned more valuable experience playing in a depleted defence and also looks a chance to debut in round one.